In The 10-Hour Coffee Diet, weight loss expert Jennifer Jolan shares a plan that produces results in the first week. The diet is very simple. Coffee lovers will enjoy their favorite beverage – enhanced with fat-burning, energizing ingredients – at least twice a day. The Coffee Diet promises that you will not only lose weight rapidly and improve your health but also save money on your food bill. The program involves only drinking coffee for the first ten hours of each day. Going without food for most of the day is known as intermittent fasting and has been associated with a range of health benefits. However, on this plan you won’t be drinking just regular coffee. You will learn how to turn ordinary coffee into 10-Hour Coffee Diet weight loss coffee. Using 3 weird tricks you will “load up” your coffee to make it better for your health. It will also satisfy your appetite so you never feel hungry and produces consistent, and focused energy. It is essential to prepare the 10-Hour Coffee Diet’s coffee properly. It gives you the nutrition you require to lose fat, feel full, beat cravings and improve your health. Protein powder preserves and protects your muscles. Unique and special timing of nutrient intake. This is similar to Bulletproof Coffee, which is popular among those on the Paleo diet. You will drink one cup of this weight-loss coffee for breakfast and lunch, then consume a normal meal for dinner. Each coffee drink provides 330 calories, 20 grams of protein and 27 grams of fat. The results will be better if you choose healthy foods for your evening meal. However, you will still lose weight even if you eat a dinner that isn’t quite so healthy. Follow this plan for six days a week and on the seventh day you can eat whatever you want. There are also 10 other variations of the diet to choose from, including a version that switches coffee for tea. Organic coffee, yerba mate tea, organic extra-virgin coconut oil, grass-fed butter, protein powder, grass-fed beef, Wild Alaskan salmon, non-starchy vegetables, fruit. The Coffee Diet suggests you do both weight-bearing exercises as well as cardio workouts on an interval schedule. This means high intensity activities such as jogging alternating with lower intensity exercise like walking. You should repeat the sequence 7 to 8 times. The best time to exercise is right before you eat your evening meal. This is because your body will more efficiently absorb all available calories to repair your muscles. It also makes your body become extremely efficient at utilizing even the bad calories. 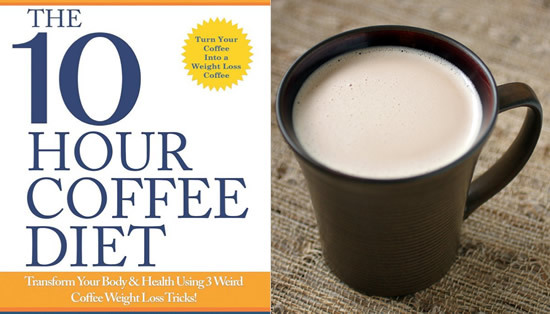 The 10-Hour Coffee Diet: Transform Your Body & Health Using 3 Weird Coffee Weight Loss Tricks! retails at $12.38. It may also be necessary to purchase a coffee-maker and a food blender if you do not already own these items. An alternative to this diet is The Café Diet which also advocates the use of coffee for weight loss. In The Café Diet, you will learn how to harness the power of the coffee bean to curb your appetite, improve your eating habits and achieve sustainable weight loss. The Café Diet retails for $9.95. Will appeal to coffee lovers. Includes an option for people who prefer to drink tea. Does not require calorie counting. Addresses the importance of pure drinking water. Reduces the cost of your food bill. Not suitable for individuals who are sensitive to the negative side effects of caffeine. Dieters are likely to experience hunger, especially in the first week of the diet. Some dieters may not enjoy the taste of the ingredients added to the coffee. Very difficult to meet all nutritional requirements only eating one meal per day. Requires the use of grass fed butter , which may not be available in all areas. The 10-Hour Coffee Diet is a weight loss program based on intermittent fasting and consumption of nutrient-boosted coffee. Since the plan encourages dieters to replace breakfast and lunch with coffee drinks most dieters will lose weight rapidly. However – as with all low-calorie diets – there is a risk of rebound weight gain when a more normal eating patten is resumed. How much weight is normally lost on this diet in the first week?